Figure 1: The general relationships between Pi and Cirrus headers. Click to enlarge. With the new Cirrus audio adapter up and running, I turned my attention to the temperature and barometric pressure sensor I had purchased for the “homemade” tablet. The device, which measures less than an inch square, is the “BMP-180” (purchased from adafruit.com) and uses the I2C communication protocol. This is advantageous, as my UART is already permanently connected to the GPS board. 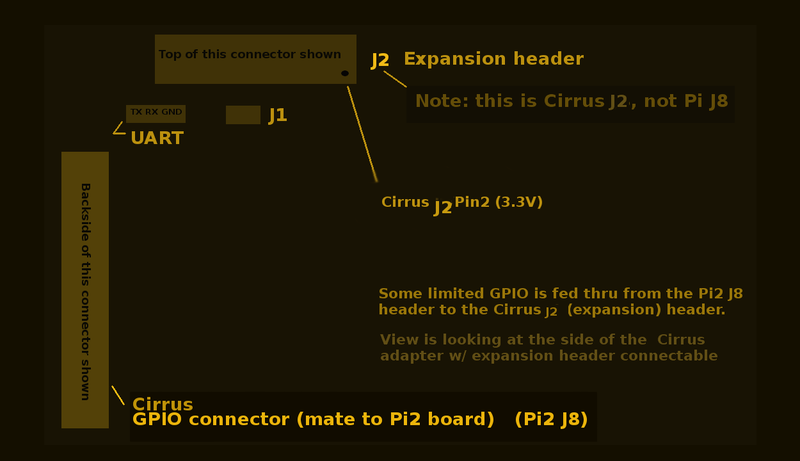 A note about the the UART: after mounting the Cirrus adapter directly to the Pi2 board, the UART pins on the Pi2 40 pin GPIO connector were of course obscured. Fortunately, the Cirrus adapter feeds the UART pins thru to a special header (marked “UART”). My little homemade connector, which was chopped from a floppy cable, sufficed to get the GPS back into operation. Note: The Cirrus audio board described in this article is a product of Cirrus Logic, which is unrelated to this site/author in any way. The Adafruit product was purchased from Adafruit Industries, NY, and is not affiliated with this author/site in any way. See http://www.adafruit.com for more information. “Raspberry Pi” is a trademark of the Raspberry Pi Foundation. They are not related to this site or author in any way.